This braised beauty will have you coming back for seconds. With its melt in your mouth texture and gorgeous flavours its sure to be a crowd pleaser. 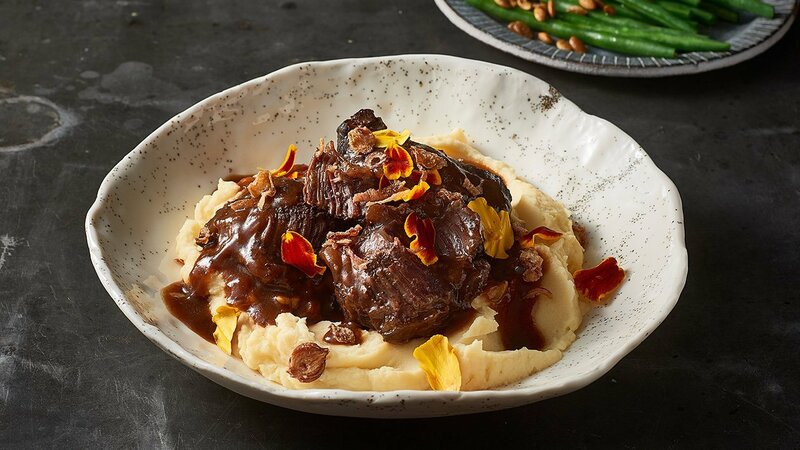 Combine beef cheeks, cola, grown sugar, liquid smoke, malt vinegar, soy sauce, KNORR Professional Garlic Puree, KNORR Professional Mixed Peppercorn Puree and KNORR Mexicasa Chunky Salsa Mild and marinate for an hour. Place all ingredients in a gastronome tray and cover with a lid before placing in oven on 190 degree Celsius for 30 minutes. Reduce temp to 150 for a further 3 hours or until cheeks are tender. Once tender remove meat from liquid and reduce liquid by half. Bring 1L water to the boil, take off stove and whisk in KNORR Instant Mashed Potato Mix. Add butter and cream and stir to combine. Buttered beans with pepita seeds.